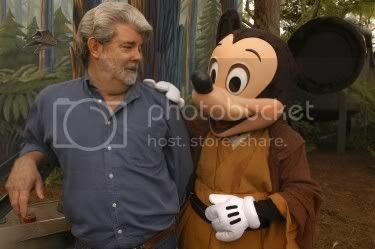 I’ve often considered trading the last of my respect for George Lucas for a bag of moldy bread and a swift kick in the kidney. Geekologie found a fed-up fellow who opted for an transaction that might spare him some internal organ damage and make him a few (Australian) bucks in the process. Because this Darth Maul represented my faith in George Lucas (it was bought back in the heady days of 1999 when the words Star and Wars still brought to mind childhood dreams and wonderment), you are also bidding on the last morsels of respect I have for the once all-powerful, formally infallible bearded wonder. If you must know, the use of the woeful Wookie ‘Tarzan’ cry in Revenge of the Sith is the straw that broke the Bantha’s back. It was almost unforgivable in Return of the Jedi, but to have it featured again in Episode 3 was just ridiculously [expletive] STUPID! I’ve made so many excuses for George in the past – even to the point of suggesting that Jar Jar would be bearable if he spoke in an alien language with subtitles – but after witnessing the CGI monkeys and gophers in Indiana Jones and the UFOs, I’ve got nothing left for him (except for what this Darth Maul represents)… And to think of the rabid, blind hope I had towards the end of the 90s before I entered the cinema to see Episode 1… [sigh] I’ll always have Lord of the Rings – all hail Peter Jackson, the new bearded wonder!! Ebay user Porl Deville, your fully-justified disdain transcends nationalities and borders. But that might just be because your disdain has a student visa and finds it pretty easy to get through U.S. Customs. Dunnoh. Took the guy long enough — thought for sure he’d say the final straw was a flaming Hut. This seems an odd ‘last straw,’ especially since, as the dood points out, the tarzan cry appeared in the first trilogy already.